I regularly go to Carmine Street in Manhattan because there are several restaurants there that I love to share with friends. In all the many trips I've made I've never really noticed the small non-script guitar store that resides there. However after seeing the film about it you can be damn sure that I will be visiting it just to see the wonders produced there. 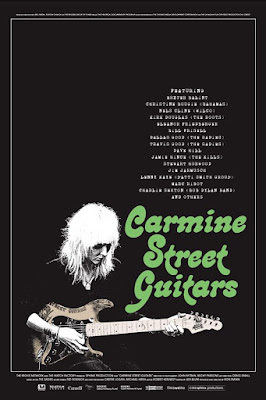 CARMINE STREET GUITARS is a "week" in the titled guitar shop during which owner Rick Kelly, his apprentice Cindy Hulej and Kelly's 93 year old mother Dorothy during which they make guitars and hang out with the likes of Bill Frisell, Jim Jarmusch , Marc Ribot, and too many others to mention. Over the course the conversations we get a sense of how Rick works, why so many people love his guitars and how he is keeping parts of old New York alive through using old wood. I love this film. This is just good time with great people talking about something thay have a deep passion for, while playing some occasional bit of music. This was manna from heaven for me, a man who loves great conversation. Part documentary, part staged conversation, any sense that this isn't really a day in the life disappears once everyone begins to talk. Nothing seems forced or out of place. It's just people lost in good conversation. Another thing I loved about the film is the passion everyone has. Watching everyone talk and play and create you feel their love of their art bleeding off the screen. 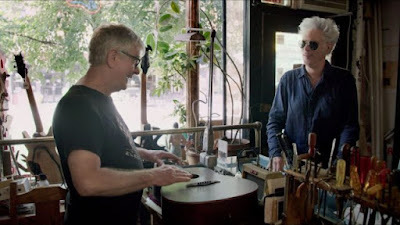 We watch the guitars come into being and musicians play them and it all looks so easy. Cindy and Rick bang out their guitars as if it is nothing- and yet we know it isn't. We watch the various musicians just whip off a song and we know it's not that simple- they are just doing what they love and what they have been doing for years and the love makes us love the film and its subject even more. When the film was done I wanted to go down to Carmine Street and hang out in the shop. While I know I could never afford anything they sell, I just wanted to be there when more wondrous things happened. This was the first great film I saw from the New York Film Festival and it's another addition to my favorite films of the year. An absolute delight and highly recommended.